At the ASU Walter Cronkite School of Journalism, they take their energy efficiency almost as seriously as they take their commitment to news. The world class facility includes the latest in journalism and media technology plus access to major-market media organizations in close proximity and even inside the building. 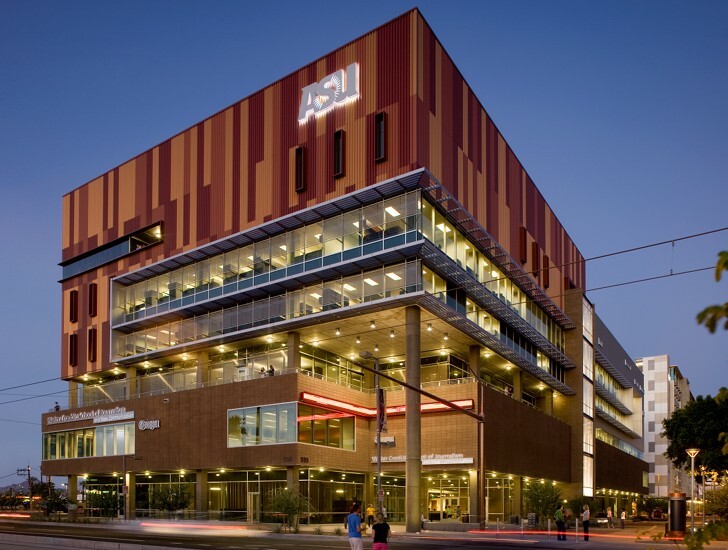 Certified LEED Silver, the downtown Phoenix building was designed by Ehrlich Architects and HDR Architecture with tons of protection against the hot desert sun. Sustainable strategies include the use of solar shading and sunscreens on the facade. Work began on the design in October 2006 and the school opened its doors in August 2008 only 22 months later. The 6-story educational facility features a large forum for public events, five digital newsrooms, two new media laboratories, seven other computer labs, two TV studios and control rooms, dozens of digital editing bays, a 150-seat auditorium, four other fully mediated classrooms, seven conference rooms and a Student Services Center with a reading room and interviewing rooms for internship and job prospects. The exterior of the building is clad in glass, masonry and multi-colored metal panels in a pattern inspired by U.S. broadcast frequency spectrum allocations (the Radio Spectrum). Sun screens on all four facades reduce the heat gain on the interior of the building. Located right in the heart of downtown Phoenix, the school is conveniently across from the ‘Taylor Mall’ – an urban green belt that runs the full length of the downtown campus and a stop of the Phoenix Light Rail, which encourages the use of public transportation. The entrance to the school features a 3-story tall, shade providing, ‘front porch‘ that connects into the ground floor retail spaces and an amply shaded arcade. The first four flours are occupied by the school, classroom and facilities, while the other floors are used by the Cronkite News Service and KAET Channel 8 Public TV. 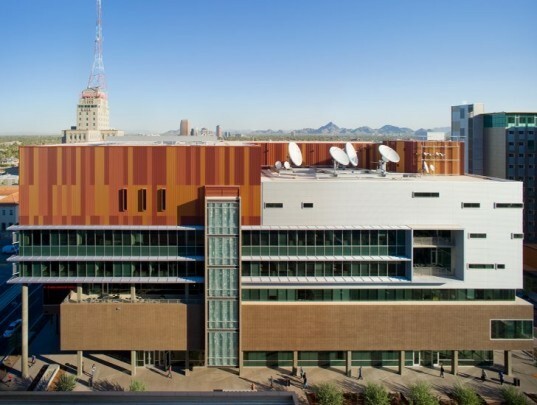 With reminders of the First Amendment placed all over the building, and a large, scrolling, electronic news ticker highlighting the most current headlines on the exterior of the building, the Cronkite School is sure to inspire the next generation of journalists. Work began on the design in October 2006 and the school opened its doors in August 2008 only 22 months later. The 6-story educational facility features a large forum for public events, five digital newsrooms, two new media laboratories, seven other computer labs, two TV studios and control rooms and dozens of digital editing bays. It also features a 150-seat auditorium, four other fully mediated classrooms, seven conference rooms and a Student Services Center with a reading room and interviewing rooms for internship and job prospects. The entrance to the school features a 3-story tall, shade providing, 'front porch' that connects into the ground floor retail spaces and an amply shaded arcade. The exterior of the building is clad with glass, masonry and multi-colored metal panels in a pattern inspired by U.S. broadcast frequency spectrum allocations (the Radio Spectrum). Located right in the heart of downtown Phoenix, the school is conveniently located across from the ‘Taylor Mall’ – an urban green belt that runs the full length of the downtown campus. The school is also next to bus stops and a stop of the Phoenix Light Rail, which encourages the use of public transportation. In fact, parking was purposely limited to encourage the use of mass transit. The grand hall serves as classroom space during the day, but transforms into a public forum where students and industry leaders discuss the most critical issues facing today’s news media. The First Amendment to the U.S. Constitution is a theme repeated throughout the building. Floor-to-ceiling versions of the Amendment are found in the lobbies of each floor, and quotes about the importance of the Amendment to journalism encircle and embrace the central forum. The first four flours are occupied by the school, classroom and facilities, while the other floors are used by the Cronkite News Service and KAET Channel 8 Public TV. The school includes high tech facilities to learn about every form of journalism. Here students take part in producing a tv new show. With reminders of the First Amendment placed all over the building, and a a large, scrolling, electronic news ticker highlighting the most current headlines on the exterior of the building, the Cronkite School is sure to inspire the next generation of journalists.